The official weigh-ins for UFC 145 took place today, at Atlanta's Fox Theatre. The official weigh-ins for this saturday’s “UFC 145: Jones vs. Evans” event took place today at the Fox Theatre in Atlanta, Georgia. The bout who will be headlined by UFC light heavyweight champ Jon Jones and Rashad Evans, also features a co-main event by welterweight fighters Rory MacDonald and Che Mills. 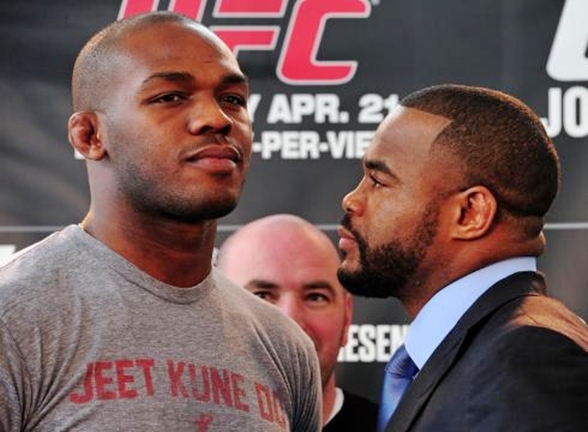 Jon Jones sat down with Rashad Evans for the last time before the UFC 145 weigh-ins and discussed their thoughts on their upcoming light-heavyweight title bout. We have the highlights from Wednesday’s ‘UFC 145: Jones vs. Evans’ pre-fight press conference that took place at Park Tavern in Atlanta, Georgia. Former training partners turned bitter rivals, Jon Jones and Rashad Evans sat down with UFC media correspondent Jon Anik to discuss their thoughts on their upcoming light-heavyweight title bout that will take place on Saturday, April 21st at the Philips Arena in Atlanta, Georgia. The upcoming event "UFC 145: Jones vs. Evans" is composed of 12 bouts. 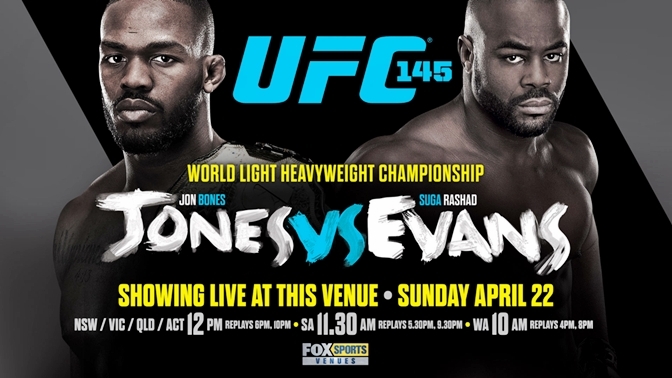 The fight card for the upcoming UFC 145 event is now official. 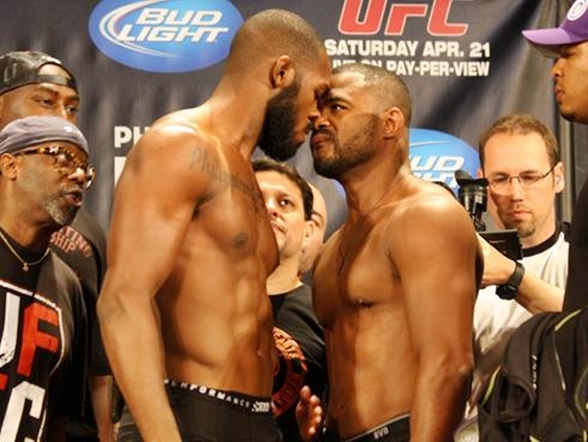 “UFC 145: Jones vs. Evans” will be composed of 12 bouts, with two preliminary-card bouts to be streamed in Facebook. The main card can be watched via Pay-per-view, while the other four preliminary-card fights is set to air in FX. 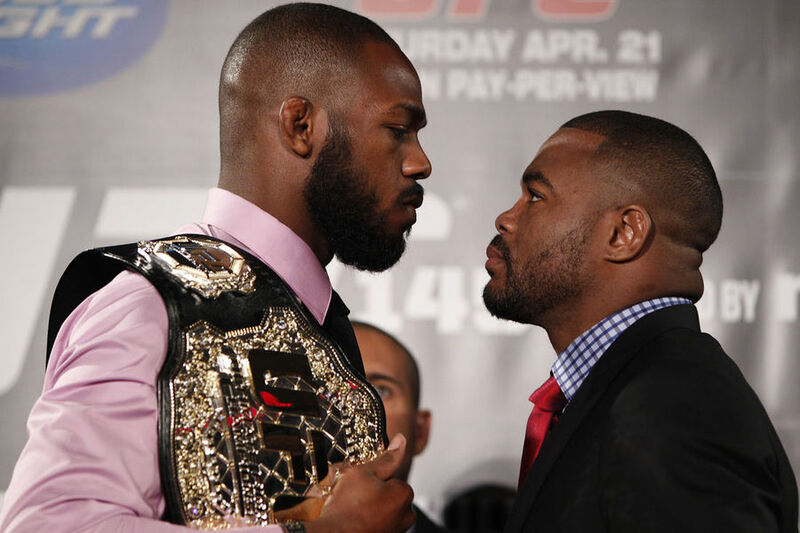 In anticipation of UFC’s next major event “UFC 145: Jones vs. Evans”, the UFC officials has recently released a 10 minute extended video preview, detailing UFC light-heavyweight champion Jon Jones and ex-champ Rashad Evans’s real life rivalry.